I love lavender. I remember one summer we went to Yugoslavia-- when there still was a Yugoslavia-- and visited the Island of Hvar. It was so slow, relaxed; greek ruins, venetian ruins, a timeless way of like, lavender honey ice cream like perfume; happiness. I'd never had lavender ice ream before, and didn't have it again for many years, until maybe 5 years ago. It tasted like perfume, like a dream. I loved the smell too. Lavender body oil, lavender bath salts. That one stuck the longest. But with pregnancy, I laid off it for a while-- lavender can be cytoxic in vitro. 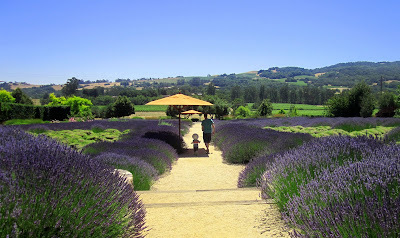 Over the long weekend we visited Matanazas Winery, and the large lush lavender fields hooked me once again. 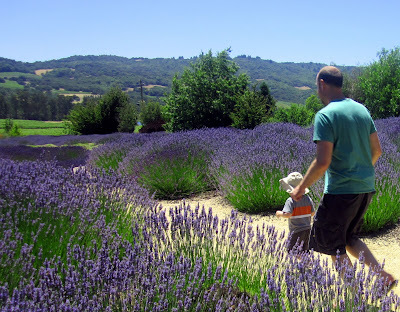 Dollars to sense comparison: lavender bath salt at the store was about $11.00; to make my own, of a similar batch size, I estimate about $2.50... of course that doesn't include a cute bag or jar-- I have one for me, but need to find some for all the jars I plan to give away! Mix together, place in jar. You can use an apothecary jar, a mason jar, whatever: does not need to be air tight.